Single player frame rate is capped at 30 FPS. See Unlock FPS. For resolutions higher than 1080p see Widescreen resolution. 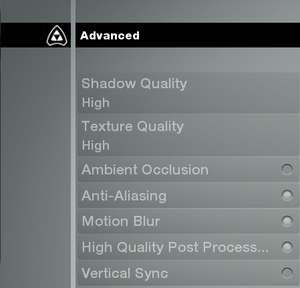 8 by default; See Anti-aliasing and Anisotropic filtering for adjusting. FXAA, toggle only. See Anti-aliasing and Anisotropic filtering for MSAA. Nvidia users can add SGSSAA with flag 0x0000F0C1. 30FPS lock in single player, not locked in multiplayer. 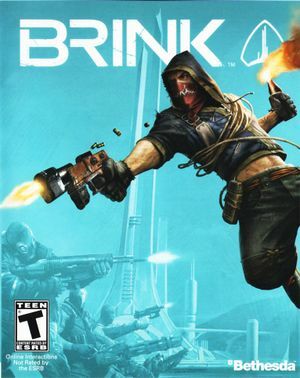 Brink has some effects that some consider annoying, such as blurring when being hit by an enemy or the red glow of said enemies. Add seta g_enemyTintEnabled "0" to turn off enemy tint and seta g_skipViewEffects "1" to turn off blurring when hit. Change r_customWidth & r_customHeight to your resolution. Set your aspect ratio in r_customAspectRatioH and r_customAspectRatioV respectively. 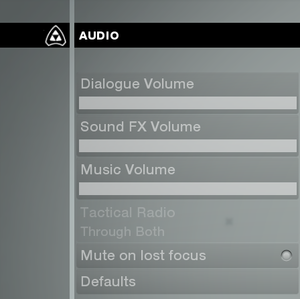 Add +com_allowconsole 1 to the launch options to enable the console. Start playing and open the console (~). 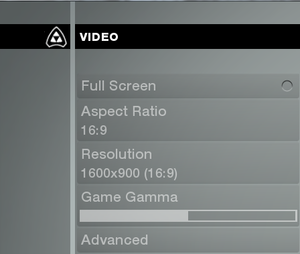 Enter ui_fov 90 (where 90 is the FOV you want). Close the console again (~). If lag occurs try setting r_visDistMult to "1.2"
Windows dedicated server is available under Tools in the Steam client. Use +connect parameter followed by the IP and port. Input r_useThreadedRenderer 2, r_usePortals 1 and/or r_useOptimizedShadows 1. Most online players are veterans and, as such, new players may find difficulty competing in matches. A guide available here shows you how to unlock the highest level instantly. Note that this does not give an unfair advantage, as it merely unlocks existing items in game, and doesn't conflict with anti-cheat systems so long as the "hack" part is performed in single player. ↑ 1.0 1.1 File/folder structure within this directory reflects the path(s) listed for Windows and/or Steam game data (use Wine regedit to access Windows registry paths). Games with Steam Cloud support may store data in ~/.steam/steam/userdata/<user-id>/22350/ in addition to or instead of this directory. The app ID (22350) may differ in some cases. Treat backslashes as forward slashes. See the glossary page for details.